2 star hotel le coin de mire hotel beach view seeing coin de mire island208 views2*Le Coin de Mire Hotel overlooks the spectacular lagoon of Bain Boeuf. Looking seaward, one finds a topical postcard view on the northern islands. A small coastal road separates the hotel from this beautiful view and a white sandy beach. Offer a view of the splendid tropical sunsets with the distinct silhouette of Coin de Mire Island in the background. A variety of land and water sports are available free of charge for all hotel guests. 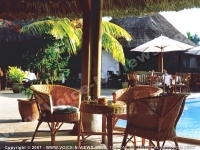 2 star hotel le coin de mire hotel garden view160 viewsCoin de Mire Hotel garden view. A small and charming Hotel, overlooking the spectacular lagoon of Bain Boeuf; only 4 km from the lively village of Grand Bay with its variety of restaurants, bars and boutiques. Its 75 rooms are all facing the lush tropical garden surrounded the hotel. 2 star hotel le coin de mire hotel pool bar165 views2* Le Coin de Mire bar and swimming pool view. The hotel has two swimming pools. The pool is located near the bar where one can enjoy a cocktail while relaxing in the pool. 2 star hotel le coin de mire hotel pool bar at night299 views2* Le Coin de Mire pool and bar at night. The lights from the bar illuminate the pool beautifully at night. The Belle Vue Bar which is open daily from 10am serves snacks and tropical cocktails. Bar and restaurant are grouped around the swimming pool in a nice setting. 2 star hotel le coin de mire hotel standard room181 views2* Le Coin de Mire bedroom view. The standard bedroom is decorated in pinks and oranges. The bedroom leads onto a bathroom. The rooms are tastefully furnished in the local style of the island with cane and wooden furniture to convey a warm and welcoming atmosphere. 2 star hotel le coin de mire hotel superior room173 views2*Le Coin de Mire superior room view. The rooms are all facing the lush tropical garden surrouding the hotel. The rooms are furnished in the local style of the island with cane and wooden furniture. The rooms are equiped with air-conditioner and fan. 2 star hotel le coin de mire hotel the reception213 viewsThe Belle Vue Bar which is open daily serves snacks and tropical cocktails. Bar and restaurant are grouped around the swimming pool in a beautiful setting.